Claudin-2 is a new therapeutic target of IBD. The antibody binds to extracellular domain of claudin-2 and improves barrier function of bowel. The epithelial tight junction controls the paracellular transport in the intestine and also prevents uptake of larger molecules. Claudin-2, one of the claudin-family regulating intercellular tight junction, forms a paracellular channel for small cations and water. It is expressed in leaky epithelia in small intestine for the paracellular transport of sodium, potassium, and fluid. In inflammatory bowel diseases, claudin-2 is upregulated in small and large intestine and leads destruction of intestinal barrier and diarrhea via a leak flux mechanism. Here, we developed a new anti-claudin-2 mAb binding to extracellular domain of claudin-2. It suppressed claudin-2 function on paracellular transport and improved barrier function of bowel in IBD model. 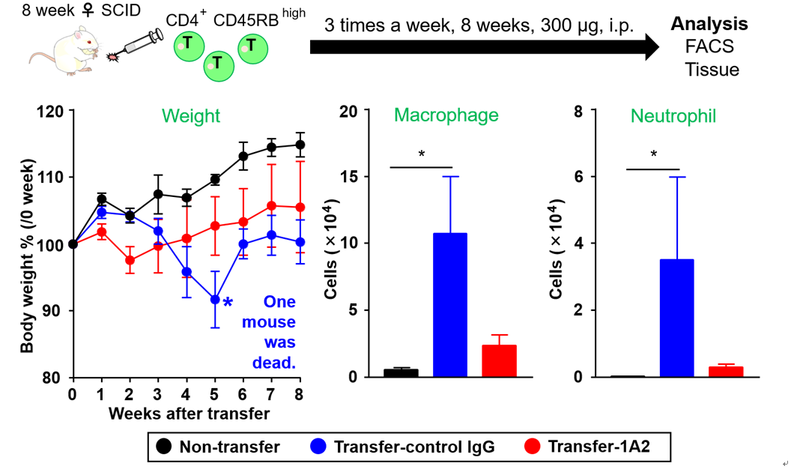 In vivo test with T-cell transferred intestine inflammation model mice revealed the anti-clanduin-2 mAb 1A2 suppressed some factors regarding to inflammation and showed improvement of intestine tissue. We are looking for a drug discovery company to collaborate with our researchers and develop this technology further. We will contact you shortly to discuss confidentiality, materials transfer, evaluation steps, and licensing opportunities. Our support is provided free of charge. The information submitted on this form is for business development use only.